Eric Trump: The Shooter Doesn't Represent The Right - Joe.My.God. “This is obviously a very sick, deranged human, sick, deranged person to do this. It seems we have gotten to a point in life and society where everything has to be kind of politicized…Somebody has to point a political finger at absolutely everything. He did the most unthinkable thing imaginable. He went to a place of worship, shot it up. Again, there are 11 people who are dead now because of it. I think we should try to pull politics out of it. This person doesn’t represent the left. He doesn’t represent the right. The person was sick, deranged. 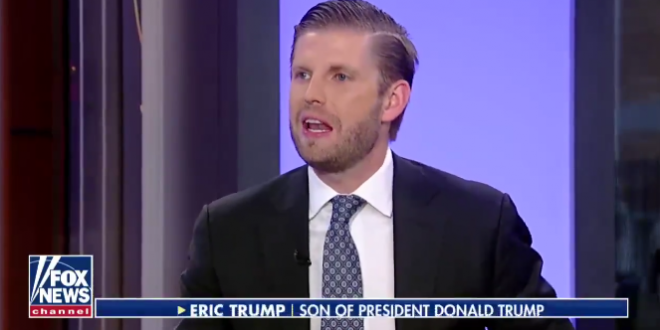 Again, I truly, truly hope if found guilty, which he will be, that he gets the death penalty.” – Eric Trump, speaking last night on Jeanine Pirro’s Fox News show.